It’s summertime which means it’s time for that all-American pastime – baseball! Maybe your groom-to-be is a huge baseball fan? Or maybe you can’t get enough of your favorite team? 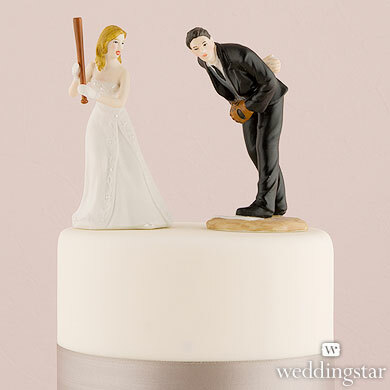 Either way, this baseball-themed cake topper would be the perfect addition to your wedding cake. Sure, the “old fashioned” bride-and-groom cake topper might be a bit dated but it’s always fun to add something traditional to your wedding cake. And a cake topper is the perfect way to add that personal touch to your cake. Plus when all is said and done, you have a nice memento to remember your big day! You can find this whimsical wedding cake topper here.